Just as promised, Microsoft has made its preview for the phone version of Windows 10 available. Also neat: this is the first Windows 10 preview (desktop included) to show off the upcoming Project Spartan browser engine. The technology is currently hosted in Internet Explorer, but expect a new browser to replace IE in future builds. In today’s preview the new engine that will power Spartan is hosted within IE. Project Spartan will replace IE on phones in a later preview. There are some caveats; new versions of Office, Mail and Calendar apps are coming in later builds, and the updated Cortana assistant is only available in English and in the US. You’ll also need one of six compatible Windows Phone devices: the Lumia 630, 635, 636, 638, 730 or 830. That’s a rather quizzical selection of devices for a first release. Most of the people who’d care to try Windows 10 on their phones will likely have a flagship device like the HTC One M8 or the Lumia 930. However, Microsoft says the lower-end devices were chosen because they already have recovery images available. Though the company says it hasn’t bricked a single device in testing, it’s not impossible, and it wants you to have a way to revert back to the previous OS should anything go amiss. After all, you can’t just run it in a virtual machine. There’s a further technical issue too: flagship devices tend to have tight OS partitions, and Microsoft is working on a tool to dynamically create the necessary room for the install process. Keeping the pool of available devices limited also helps the team isolate any potential bugs. The company says support for more phones will be integrated with each build. 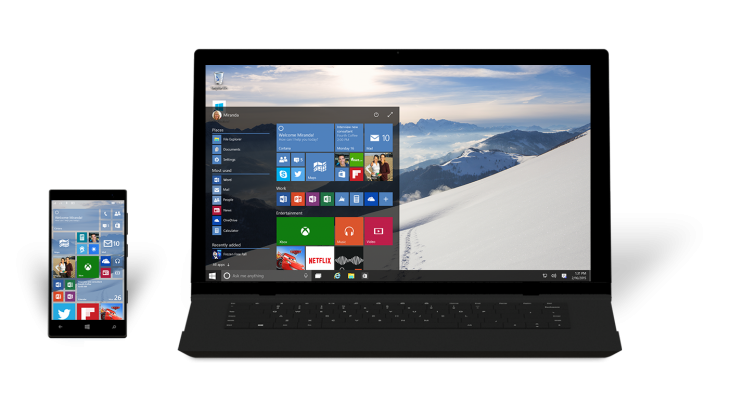 Microsoft’s phone version of Windows 10 is intended for devices of screen size 8 inches or less, but it runs on the same base as the full-size Windows 10. The company is also working on universal apps that are equally compatible with anything from phones to desktops. For more on what’s coming with the preview, as well as current known issues, check out Microsoft’s blog post.